A MAN WHO bought a sandwich at a major US airport discovered it was maggot-infested after the cheese on top started moving. Joel Woloshuk was flying out of Atlanta airport this week and picked up the snack from Cafe Intermezzo. I’m looking at what I thought was Parmesan… and the Parmesan began to move. He got out his phone and recorded a clip of the bugs. Why? This is not wilted tomato; this isn’t a moldy piece of bread. These are maggots. 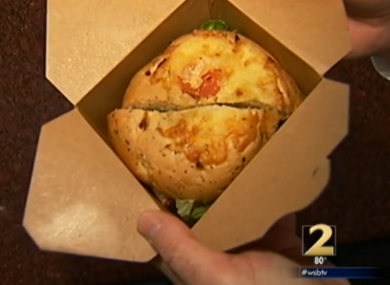 Woloshuk regarded the incident so seriously that he kept the sandwich and took it to local news station WSB-TV when he returned to Atlanta the same evening. In a statement to WSB-TV, Cafe Intermezzo’s president said the case was isolated and the problem could not have originated at the restaurant. He says the restaurant switched bread vendors and “not a single crumb” from the original bakery remains. Atlanta Department of Aviation officials say they’re distributing ultraviolet lights to Hartsfield-Jackson International Airport restaurants so they can better inspect food shipments. Email “'Moving cheese' on airport sandwich turns out to be maggots”. Feedback on “'Moving cheese' on airport sandwich turns out to be maggots”.